Congratulations to one of our students Manoj Kumar.V [3rd year Mechanical] for clinching the prestigious prize of Mr. Techofes! Techofes is a national level cultural program conducted by the College of Engineering, Guindy. It is a once a year event and has a kaleidoscope of events which test the various skills of students and is renowned for having headlining acts.One headlining event in Techofes is the competition called Mr. and Ms Techofes. Not easy to win this one - there are 10 rounds of competitions which are all tailored to test your creativity and your talents. At the end, the winner is decided by the audience gathered to watch the event. The ten grueling rounds started on Feb 12 and continued on till Feb 14 when he was crowned the coveted title. First an introduction about our winner. He is a dedicated NCC Cadet and is considered a funny man by his classmates. He is very friendly and approachable for anything and also has a notorious reputation of mimicking his classmates and teachers with deadly accuracy. He is also a very good dancer and can bust moves like Jagger.He started his climb towards Mr. Techofes on Feb 12 on a stage called the informal stage which consisted of two rounds, the first being a dance round where he had to replicate the moves as they are from a music video played by the organizers and in the next round he had to conduct a version of the famous TV show on Sun Music called “Konjam Nadinga Boss” where he had to call up a volunteer on stage and the volunteer had to repeat the dialogue given by him, verbatim. 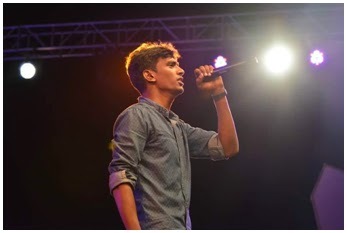 The next rounds of competitions were held formally and the first competition was a comp called Adapt where he had to sing songs according to the genre called out by the panel. The next one was a comp called Mix Bag where he had to dance to the varying tunes played by the organizers. Moving on to the next event he had to do a movie review of a movie given by the judges. He also had to sing a song while dancing to a song from the movie. Personally I wouldn’t have been able to achieve this feat; I can only take my hat off to him. The next event was called Channel Surfing where he had to act out programmes from different TV channels called out by the organizers. All these competitions aren't easy mind you; it takes great presence of mind to act according to the channel called out by the organizers. 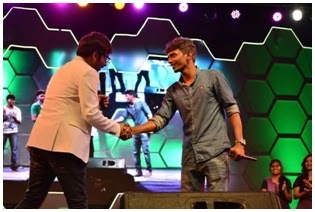 The finals were conducted by the famous radio RJ Balaji who is renowned for his “kadi” jokes and comical film reviews on Kollywood movies. In the first round of the grand finale he had to perform a special talent of his. 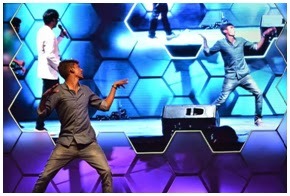 Our boy did what he does best “Mimicry” - only to gain fans from the celebs and the audience gathered. The next round of the finale was a debate with the other contestants on the topic, “Who is sad on valentine’s day- whether is it the boys or the girls?” Our man stuck to his guns and chose to stand for the guys much to the applause of the audience. His prowess of giving sharp counters and tackling of his opponents left them fumbling for words!! !The next round was one where he had to replicate a dance from a kollywood song chosen by the judges. Our man got the song “What a Karvaad” sung by Dhanush. The rules of the round are to replicate the moves in the song using the least number of takes.Here we see Manoj busting the dance step from the song made famous by Dhanush. I hear from him that, this was one of the easier rounds as the song didn't have many moves and was a relatively easy one to dance and since the original was a huge hit getting the audience support for his version of the moves wasn't very difficult. Seen in the picture standing on the left is the famous RJ Balaji who conducted the final round of the competitionFor the final round of events Manoj was back to one of his favorite skills - “Acting”, where he had to act out a scene from a movie with the least number of takes. This was similar to the one he did earlier on the informal stage except, in this one he was a participant and had to do a dialogue in the least number of takes. This was of course second nature for him and he executed it with ease which helped him clinch the prize that was awarded to him on the 14th of February by the man who conducted the final round of the competition, RJ Balaji. Manoj credits his success to God and all his close friends and relatives who supported him. I heard that he stayed over in CEG for a night just for this competition which shows his dedication and commitment.So all I can say is Hats Off!! And wish u the best in all the upcoming competitions and Endeavour’s. Make our college proud! All the best on behalf of KCG college of Technology.